a spot of whimsy: winter beauty: february 3, 2012.
winter beauty: february 3, 2012.
fun fact: ever since i saw the movie iron will when i was a little girl, i've harbored a love for white sled dogs. 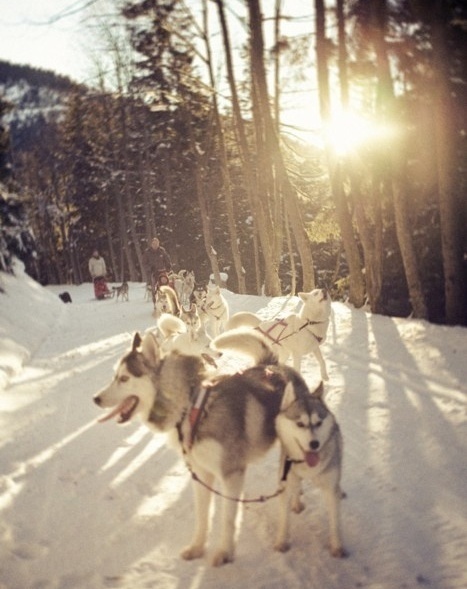 i'd love to try dogsledding, just once, under controlled circumstances (so i don't, like, drive us over a cliff or something). This has me craving snow and a new puppy! And yes... no driving off of cliffs. That would ruin the dream wouldn't it? I LOVED Iron Will when I was a kid! I harbor a secret dream of living kind of in the wilderness with dogs like that. The second picture is my favorite! alex- hahah that it would!